The Aswan Dam, located in Aswan, Egypt, tames the Nile River and utilizes the power of the river for a variety of social and economic causes. There are actually two dams on the Nile River at Aswan, the Aswan High Dam and the Aswan Low Dam, both of which work together to prevent the annual large floods from the Nile. Prior to the building of the Aswan Dam, the Nile flooded every winter, potentially destroying any crops that were planted in the fertile Nile Valley. For the purpose of this article the two Aswan Dams will be counted as a single dam, due to the fact that their effects are virtually inseparable. 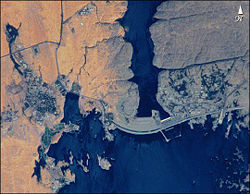 The Aswan Dam is a rock fill dam, a type of dam that relies on compacted dirt for its stability. Unlike a traditional cement dam, a rock fill dam relies on the friction between small particles of stone and dirt to maintain its stability. Rock fill dams also need to be placed in a solid bedrock of rock for stability. The traditional elements of a rock fill dam, stone and clay, are the main material elements of the Aswan Dam. 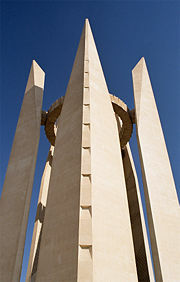 The towering edifice extends 111 meters from the ground, to hold back an astonishing 5.97 trillion cubic feet of water. The water that is held back by the Aswan Dam forms the Lake Nasser, a major source for water in the area. The water that is held back by the dam rushes into the reservoir at a maximum of 11,000 m³ of water per second. To allow for the possibility that heavy rainfall could push the maximum flow of the dam, a series of emergency spillways have been built around the dam to safely process an additional 5,000 m³ per second. Most of the water that enters into Lake Nasser is slated for agricultural causes, as the area experiences very little annual rainfall. The water from the reservoir is applied to crops on the field through an extensive irrigation system, a system that allows two crops a year to be produced. This is a significant change from traditional farming methods that rely on natural precipitation. When utilizing natural precipitation as the sole source of agricultural water, only one crop a year can be produced. When using artificial irrigation, the crop yield of the area can be doubled, which enhances the economy of the region. Approximately 8 million feddans (a unit of measurement roughly equivalent to an acre) receive water from Lake Nasser for irrigation purposes. The agricultural yield of the dam is about an 83 percent efficiency, which while not high on first glance, is considerably higher than many other dams built around the world for the same purposes. One flaw in the system of water distribution, however, is the flow of water down the series of branch canals. Many feel that the water flow down the branch canals is not equally distributed. The irrigation aims of the Aswan Dam are often complicated by the chemical composition of the water flowing down the Nile River. The water that reaches the dam has a saline composition of approximately 0.25 kg/m3, a composition commonly referred to as "sweet water." The levels of salt in the Nile water have allowed for another industry to develop around the Aswan dam: That of salt exportation. Through a series of extraction methods, the Egyptian government has been able to export a large amount of salt to the world markets. In 1995, the levels of salt exportation from Egypt were higher than the levels of salt imported, an unusual occurrence for the Egyptian economy. At this time, over 27 million tons of salt are exported from Egypt, much of which derives from the Aswan Dam. The Nile River has been a focus of engineering interest since the later nineteenth century. It had long been thought that a dam in the area would prove highly beneficial for the neighboring communities and agricultural lands. To this end, British engineers began work on the first Aswan Dam in 1899. Construction continued for three years, but the final product proved to be inadequate for the strong currents of the Nile. In response to the failures of the original dam, the height of the Aswan Dam was raised in 1907, and again in 1929. The two lengthy attempts to raise the height of the dam still proved insufficient to contain the river's flow. The dam nearly overflowed in 1946, prompting the authorities to reconsider the future of the old dam. 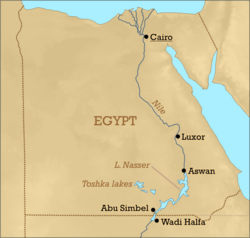 Rather than simply add to the height of the dam, as had been attempted in the past, the Egyptian authorities decided to built a second dam farther down the river. Construction on the second dam began after the Egyptian Revolution of 1952, when Gamal Abdel Nasser gained political control of the country. The second dam was originally intended to be a joint effort between Egypt, the United States, and Great Britain, but the foreign backers pulled the funding before construction began. 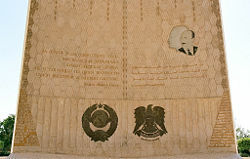 Without the promised funding from the United States and Great Britain, Egypt was left unable to fully fund the ambitious building project. Recognizing the need for monetary funds, the Soviet Union offered to provide some of the needed funding to gain a foothold in Africa during the Cold War. Most historians agree that the Soviet funding of the Aswan Dam was related more towards an attempt to gain a long term foothold in the area, rather than an attempt to gain economically. For the construction, the Soviet Union provided technicians and large machinery, as well as funds. Construction on the second dam lasted for twenty years, from 1950 to 1970. In an unexpected construction method, the reservoir was allowed to fill with water before construction was officially completed. However, in light of the endemic dryness in the region, the attempt to gather as much water as possible can be easily understood. 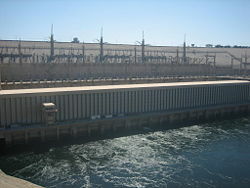 The main benefit of the Aswan Dam is its ability to control the annual flooding of the Nile River. Because of its ability to prevent the annual floods, the dam has helped the agricultural industries in the area. The dam has also provided much needed water for irrigation, as well as producing electricity from the hydroelectric output of the river. The dams helped Egypt to reach its highest ever level of electric production, granting many small villages the luxury of using electricity for the first time. Despite the benefits of the Aswan Dam, blocking the flow of the Nile River has caused a few environmental concerns that need to be weighed against the economic benefits. First, the creation of Lake Nasser flooded a large part of Nubia, forcing 90,000 people to lose their homes and their homeland. During the initial floodings, it was found that Lake Nasser destroyed many rich archaeological sites, which could have benefited the study of the cultures and history of the area. Another set of environmental issues revolves around the agricultural lands that the dam was expected to benefit. Instead of feeling the full benefits of the dam, some agricultural fields have become waterlogged as a result of silt deposits that build up in the reservoir. Other fields have been slowly eroded, particularly of coastline. In addition, the delta has lost much of its acclaimed fertility, due to the fact that the Nile River no longer carries nutrients all the way to the mouth of the river. ↑ R.J. Oosterbaan, Impacts of the Irrigation Improvement Projects in Egypt (Wageningen, The Netherlands: Egyptian-Dutch Advisory Panel and International Institute for Land Reclamation and Improvement, 1999). This page was last modified on 22 April 2016, at 15:10.